You would think a peace movement would be the least patriarchal of all social movements but you can masculinise anything. Feminist understanding challenges what it really takes to make peace. Cynthia Enloe spoke to Marion Bowman this week at WILPF's Centenary Conference in the Hague on 'Women's Power to Stop War'. 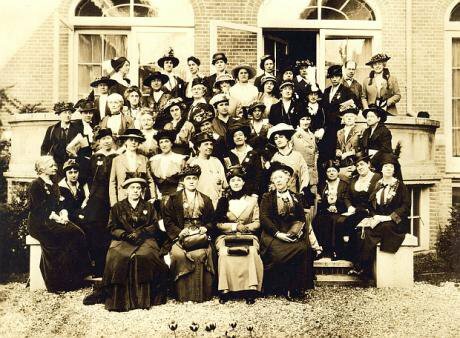 Marion Bowman: The 1915 Women’s Congress at which the Women's International League for Peace and Freedom was founded had a backdrop of social segregation between women and men with women excluded from public life. Is the backdrop different now? Cynthia Enloe: I think when we look at those fabulous photographs of those women in 1915, they look as though they do live in another age. They seem to be dressed in an almost Victorian way, not even Edwardian, and it seems as though it’s ‘back then’. Now we appear different, we seem to move more freely, but in fact in a lot of public life, the segregation has continued, based on the notion that only certain kinds of men and virtually no women, unless those women can pass as men in the way they present themselves and talk, can really understand the complexities of public life. It’s the masculinisation of complexity. Now in fact women in all walks of life deal with, cope with, challenge complexities all the time but it’s so narrowly defined as to what kind of person you have to be to handle questions of the arms trade or questions of financial reform that I think the segregation has been modernised. It’s changed its public appearance but it still exists in that mindset about who can handle the complexity of modern life. It’s a myth but a very important myth. MB: Throughout history binaries have been important – women/men, us/them, soldier/civilian - why? And have they broken down at all? CE: They are important because they are a way to tell a story that seems as though it’s got a more driven plot. I think about this all the time. I’m not a story teller but I find that the way that stories get told that get passed on are the stories that have powerful ‘us and thems’. Feminist story-telling is much more engaging and interesting because it takes on board that there are not just grey areas in between, there are overlaps and contradictions and fluidities. Those are the stories that are much more gripping than these cartoon stories made up of these simplistic binaries. You never can solve a difficult problem by resorting to a narrative of binaries. It doesn’t work. MB: Is the concept of equality helpful in the context of war and peace? I’m thinking of women soldiers. CE: It depends on who sets the bar as to what you are trying to be equal to. The question of women’s equality in state militaries or women in insurgent militaries are rather different questions. So I’ve spoken to a lot of women who are former soldiers or currently soldiers or young women aspiring to be soldiers and a lot of them are motivated because they want to break down walls that privileged their brothers. But a lot also see joining the military as the only way to prove they are real patriots. I think that’s very worrisome. I speak very respectfully to women in militaries because I need to learn from them – what are they doing? – why did they think it was appealing to join? - but I need to respect the fact that a lot of these women are fighting sexism inside a very sexist institution and women who fight sexism inside any powerful institution need to be listened to. So I am quite willing to admit I am on a see-saw between, on the one hand, being very wary of the notion that women joining their state’s militaries are advancing genuine equality and, on the other hand, listening to women in militaries rather than just dismissing them as somebody’s puppet. That I don’t think gets us anywhere. MB: What does the incorporation of women into militaries do for concepts of femininity in civilian life? Is the distinction between civilian and military life blurred by it? CE: I think conventions of femininity are different from place to place and age to age but the idea of femininity is alive and well. It’s pushed by the fashion industry and the general media. The idea of what’s feminine and what’s not has been challenged but it’s very powerful. So you can see military recruiters and commanders trying to play with that. On the one hand they have to convince parents of girls and friends of girls and boyfriends and husbands of young women that joining the military will not make them unfeminine. On the other hand, they have to convince them that joining will be progress, that they will do something that usually only their brothers were allowed to do. So you can watch a lot of confusion on the parts of militaries, and I’m always very interested in watching patriarchal confusion. Oftentimes you will see photographs of women in recruiting posters - they may be in full uniform but in the next picture they will be putting on makeup in their off hours - which really says to the worried parent or the young girl thinking about joining ‘Don’t worry, dear mother, don’t worry, dear young school girl, you can be a real soldier and still keep your femininity’. MB: When women first started demanding equality and a share of power, like the 1915 women, they were told it was ‘unnatural’, that it was abandoning their function as mothers, even that their reproductive organs would stop working. Has that gone? CE: I don’t think it ever really goes, the threat has been updated, modernised, but there is a still worry in the general public that soldiering is really mainly a man’s job. The first thing militaries realised they could do was recruit women into military nursing. I became very interested in the history of nursing because I could follow the history of debates about femininity. As more women have moved into classically masculinised roles, the politics of femininity is still vital to explore because you can also shed light on militarists’ confusion and that is very useful. I don’t think the politics of femininity has gone away. You can see a lot of women in women’s movements really trying to make sure that people who are coming in don’t imagine that their own femininity is going to be jeopardised by being part of a strong feminist movement, because the media and anti-feminists portray feminists as somehow not feminine. MB: Why is the issue of women in combat roles, on the frontline, killing people such a potent question? CE: The first thing is that it is the last bastion of masculine privilege in most militaries and one of the things I’ve been told by a lot of women in militaries challenging the sexism in their institutions is it is also the kind of experience you have to have if you are going to rise to a senior officer’s position. We don’t think of that oftentimes, but a military is just like a business, it’s is a career system. It’s not just a fighting force, it’s a ladder for promotions. One of the reasons why women officers battled to break down the men-only combat rule is not because they wanted to be in combat. Most said they were not interested in carrying big packs and slogging through the mud, rather they didn’t want the area of military jobs that was most the masculinised to also be the one that is most likely to earn you promotions. It was really a promotion discrimination system they were challenging as much as it was wanting to fire a gun. But I think a lot of patriarchal men and women who see combat as something that only real men can do, they did feel very challenged by it. They really felt it was going to dismantle the kind of masculinity they think is the core valued masculinity. They did feel challenged. MB: Where are the men’s peace movements? CE: There are men’s peace movements. We can see them in some of the new men’s anti-violence movement, we can see them in a lot of the conscientious objector movements that were very powerful in apartheid South Africa and that still exist in Germany, South Korean and Turkey. But what has often been found by women peace activists, especially as they become feminists, is that even in a peace movement that doesn’t have a feminist consciousness, men still think they know the most about wars so they are the best leaders of a peace movement. They think they know the most about public speaking, they know the most about the technicalities of weaponry so they think they are the peace experts in a very narrow masculinised way unfortunately. You would think a peace movement would be the least patriarchal of all social movements but you can masculinise anything. Groups like WILPF with a feminist attitude and feminist understanding of what it takes to make peace have really challenged what it takes to make peace. MB: Is there a crisis for men in the post-industrial western world that is having an impact on war and peace? CE: I’m very interested in recruiters – they have to meet quotas, especially for governments that have done away with male conscription. They have to find some way to persuade 17, 18, 19 year old men that joining the state’s military will make their lives more satisfying, give them a sense of being real men, give them skills (which is often a myth), give them status in their communities. Recruiters often have a hard time. Every recruiter I’ve ever listened to says unemployment is really good for them. When the economy is tanking, with fewer jobs, specifically male jobs, when construction has gone down, then military recruiters can fill their quotas. They still have to do persuasion, they still have to play the masculinity card but they can also play on young men’s worry about not having a job. When economies revive especially when they revive across racial and ethnic communities, because most economies are divided amongst men in racial and ethnic terms, the military recruiter’s job becomes much harder. So healthy economies and economies that are not racialised are helpful in building alternative notions of how a young man can gain a sense of self esteem and even social security in ways other than wielding the government’s gun. Cynthia Enloe was speaking to Marion Bowman at WILPF's Centenary Conference in the Hague on 'Women's Power to Stop War'. Read more interviews and articles from the conference in 50.50's series Women's Power to Stop War.